In the encyclical Laudato Si’, Pope Francis has asked as to begin a new dialogue, a conversation that “includes everyone”, “ each according to his or her own culture, experience, involvements and talents”. 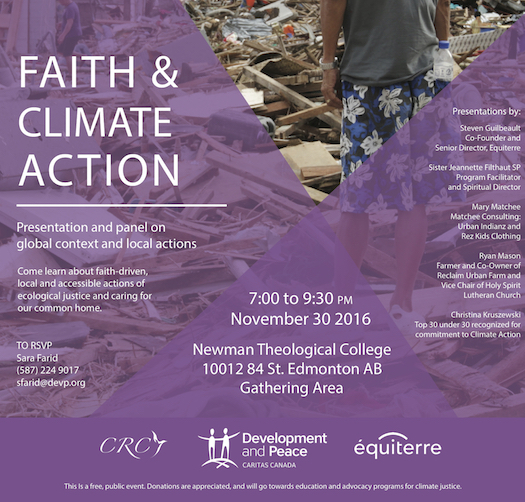 On November 30th join us at Newman Theological College to learn about faith-driven, local and accessible responses to the global challenge of ecological justice and caring for our common home. This is a free, public event. Donations are appreciated, and will go towards education and advocacy programs for climate justice. Come learn about faith-driven, local and accessible actions of ecological justice and caring for our common home.